This appetizer includes all the classic Greek ingredients, and comes together quickly. 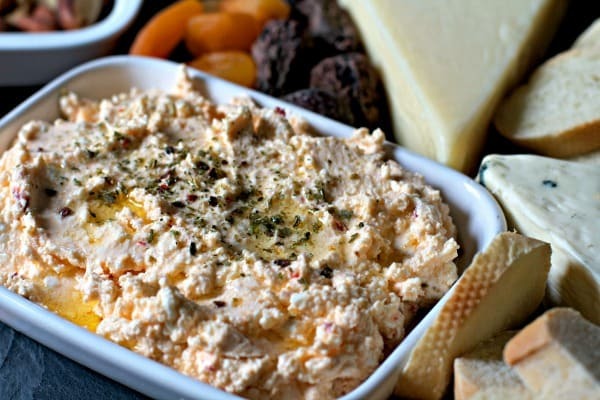 In a food processor, place the feta cheese, olive oil, lemon juice, garlic, sun-dried tomatoes and oregano. Using the pulse setting, blend the mixture until smooth. Transfer to a medium bowl. Blend in the olives by hand or with a spoon. It’s called puttanesca, which means the sauce of the ladies of the night. It’s spicy, sharp, intensely flavorful, and very, very good for you. 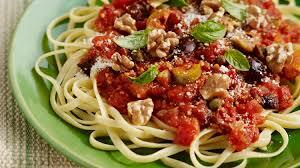 Ingredients include olive oil, tomato sauce, onions, garlic, hot chile peppers, capers, anchovies and olives. In addition to packing a powerful taste punch, it’s exceptionally beneficial, proving the notion that food can also be medicine. Let’s run through this marvel of culinary pharmacology. First of all, you start with olive oil, extra virgin. This is heart-healthy oil, reducing the risk of cardiovascular disease, which is the primary killer of adults worldwide. Rich in mono-unsaturated fats, olive oil is a key part of a heart-healthy diet. Tomato sauce provides the base for a good puttanesca, and it also provides lycopene, a red antioxidant pigment that helps to protect cells overall, and has specific protective benefits for the prostate gland, helping to reduce the risk of prostate cancer. Onions seem common, and often people don’t think about them much. But they are exceptionally good for reducing serum triglycerides, for thinning blood, and for reducing the risk of atherosclerosis, or hardening of the arteries. Onions are highest in the super-antioxidant quercetin, which not only inhibits the aging process, but has anti-cancer properties as well. Garlic is legendary for keeping vampires away, but its best role is in fighting bacteria. Used as an antibiotic, garlic kills almost every bacteria that can contaminate food. Studies show that garlic also helps to reduce high blood pressure, acting in a manner similar to that of blood pressure medications, by decreasing peripheral vascular resistance. Hot chile peppers do more than add some zip to a dish. They also act as vasodilators, improving the rate and volume of blood flow, thereby improving nourishment to all parts of the body. Additionally, hot chiles are thermogenic, which means that they burn calories. In fact, hot chiles can help you to burn an average of 20 percent more calories after eating. On top of that, hot chiles cause the brain to produce feel-good endorphins, thus enhancing mood. Capers, which come from a Mediterranean bush, not only add a bit of salty flavor to the sauce, but also possess anti-cancer properties. Capers help to reduce the risk of ulcers by inhibiting the ulcer-causing H. pylori bacteria, and they additionally improve blood sugar by reducing high blood sugar after a meal. As if that weren’t enough, capers are a traditional remedy for the relief of rheumatic pain, due to their anti-inflammatory action. Anchovies add a bit of fish flavor and protein to puttanesca sauce, and are also rich in heart-healthy Omega 3 fatty acids. Omega 3’s help the body to maintain a healthy cardiovascular system, improve skin and metabolism, enhance mental health and cognitive function, and are anti-inflammatory, thus reducing the risk of most major chronic degenerative diseases. Mashed up in puttanesca, anchovies add a special tang. Lastly olives round out puttanesca, providing many of the same cardio benefits as olive oil, in addition to adding flavor and texture.